Richard Felton Outcault (January 14, 1863 - September 25, 1928) was an American comic strip scriptwriter, sketcher, and painter in the late nineteenth and early twentieth centuries. Popularly known as R.F. Outcault, he is considered the inventor of the modern comic strip and credited for making comic strips a lasting part of American society. Starting out as a technical illustrator for Thomas Edison, Outcault later wrote articles for humor magazines, which spawned his career in creating series of comic strips for the New York World and the New York Journal newspapers. 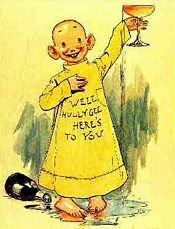 In 1895, Outcault introduced his popular comic strip, Hogan's Alley, featuring his famous "Yellow Kid" cartoon character. 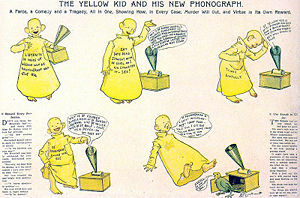 "The Yellow Kid" was the first recurring comic strip character, and his yellow colored nightshirt ushered in the era of colored comic strips. Outcault later introduced the popular cartoon, Buster Brown, in 1902. "The Yellow Kid" and "Buster Brown" cartoon characters eventually led to a line of products including toys and shoes (Buster Brown Shoes). Outcault was a key creator of the art of cartoons and comic strips. From fine art to political commentary and entertainment, these have played an important role in shaping the modern world. Richard Felton Outcault was born on January 14, 1863, in Lancaster, Ohio, the son of Jesse and Catherine Outcault. He demonstrated an artistic talent at a young age, and in 1878, at the age of fifteen began studying art at the McMicken University School of Design in Cincinnati. After studying there for three years, Outcault started working as a painter, yet soon found himself doing technical illustrations for Thomas Edison's Edison Laboratories. As a traveling artist for Edison, Outcault spent time in Paris, France, while he was working at the World's Fair, and studied art in the there. Outcault enjoyed his stay in Paris, and discovered a love for berets. When he returned to the United States, Outcault settled in New York City, and married Mary Jane Martin on Christmas Day, 1890. They had two children, a boy and a girl. In New York, he did freelance illustrator jobs and started working at Electrical World magazine, which stimulated his creativity and desire to produce comic strips. Outcault then proceeded to work for several different newspapers, where he created the famous cartoon characters The Yellow Kid and Buster Brown. During his retirement, Outcault spent time painting portraits and landscapes. He died on September 25, 1928, in Flushing, New York, at the age of 65. Outcault began his career in 1881, as a painter for the Hall Safe and Lock Company. In 1888, Thomas Edison hired Outcault to produce sophisticated technical illustrations for the Edison Laboratories this electric light display of the Exposition of the Ohio Valley and Middle Atlantic States in Cincinnati, Ohio. Edison was so impressed with the quality of Outcault's work, that Edison hired him to work in his West Orange, New Jersey, facilities. Outcault returned to New York City and wrote some humor sketches for magazines including Judge, Life, and Truth, but soon joined Joseph Pulitzer's New York World. Pulitzer used Outcault's comics in an experimental color supplement, using a single-panel color cartoon on the front page called Hogan's Alley, depicting an event in a fictional slum, based on life in New York City. A character in the panel, The "Yellow Kid," was a bald kid named Mickey Dugan, a ghetto urchin living in the street, whose oversize nightshirt always had some kind of saying written on it. Hogan's Alley debuted on May 5, 1895. The color yellow was picked because it was difficult to print at the time, and one of the foremen at the newspaper wanted to try yellow on the kid's nightshirt as a simple test. Outcault loved it and "The Yellow Kid" became a very successful comic strip in the Sunday newspapers. Hogan's Alley was the first recurring cartoon in newspapers, and the success of The Yellow Kid ushered in the era of the colorful comics in newspapers. Richard Felton Outcault created the cartoon characters "The Yellow Kid" and "Buster Brown"
The popularity of The Yellow Kid fueled a bitter battle between rival publishers over property rights. 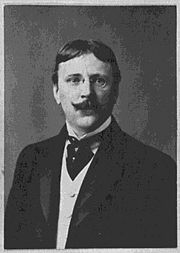 In October 1896, Outcault defected to William Randolph Hearst's New York Journal. The result of a lawsuit awarded the title, Hogan's Alley to the World and "The Yellow Kid" to the Journal. The combination of Hearst's sensational journalism and the flashy bright The Yellow Kid cartoon character associated with his newspaper gave rise to the phrase, "yellow journalism." By 1901, Outcault had become weary of legal battles between the New York World and New York Journal so he created the comic strip Poor L'l Mose for the New York Herald. However, Outcault would be lured back to the Journal the following year. In 1902, Outcault introduced Buster Brown, a mischievous boy dressed in Little Lord Fauntleroy style, and his dog, Tige. 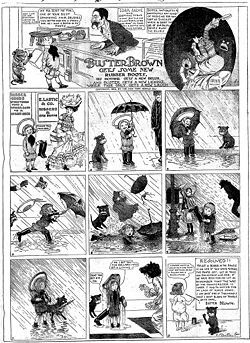 The Buster Brown comic strip was featured weekly every Sunday, until 1920, in the New York Journal. The strip and characters were very popular and Outcault eventually licensed the name for a number of consumer products, most notably Buster Brown shoes. For example, a hosiery manufacturer used the image of Buster Brown's dog Tige unsuccessfully trying to rip his socks in order to demonstrate the strength of its product. In the Journal, Outcault began experimenting with using multiple panels and speech balloons. Although he was not the first to use either technique, his use of them created the standard by which comics are measured. Many cartoonists would imitate Outcault's style and make it their own. Outcault also created other comic strips during his career, such as Tommy Dodd and Ophelia, in the New York Herald in 1904, and another called Bobby Tucker. Because Outcault wisely protected his property rights to his cartoon characters, by 1905, he was earning more by selling cartoon character clothing and paraphernalia than he was making as a cartoonist. In 1909, Outcault created the Outcault Advertising Agency. Outcault accumulated a great deal of wealth and retired, leaving his son to run the company, to painting portraits and landscapes. The Yellow Kid was a bald, snaggle-toothed boy who wore a yellow nightshirt and hung around in a ghetto alley filled with equally odd characters, mostly other children. The Yellow Kid was not an individual but a type. When I used to go about the slums on newspaper assignments I would encounter him often, wandering out of doorways or sitting down on dirty doorsteps. I always loved the Kid. He had a sweet character and a sunny disposition, and was generous to a fault. Malice, envy or selfishness were not traits of his, and he never lost his temper (Outcault 1995). Average readers loved the cartoon, but the comic strip was not without controversy. New York elites were upset about the depiction of New York City slums in Hogan's Alley. Nonetheless, Outcault had the ingenuity and artistic talent which combined to depict situations in New York City which could make people laugh. The Yellow Kid brought humor to the social and political concerns of the day. The comic strip Buster Brown began in the New York Herald on May 4, 1902. Buster Brown, his sister Mary Jane, and his dog Tige, an American Pit Bull Terrier, soon became well known to the American public. Tige is thought to be the first talking pet to appear in American comics, and, like that of many of his successors, his speech goes unnoticed by adults. Buster Brown is a young city-dwelling boy with wealthy parents. He is disturbingly pretty (contrast him to The Yellow Kid, or Frederick Opper's creations), but his actions belie his looks. He is a practical joker who might dress in a girl's outfit and have her wear his clothes, break a window with his slingshot, or play a prank on a neighbor. The trick or transgression is discovered and he is punished, usually by being spanked by his mother, but it is unclear if he ever repents. Many strips end with Buster delivering a self-justifying moral which has little or nothing to do with his crime. For example, a strip from May 31, 1903, shows him giving Tige a soda from a drugstore soda fountain. The drink splashes, not only the front of his own clothes, but the skirts of a woman's splendid dress. Horrified by his clumsy misadventure, Buster's mother takes him home and flogs him with a stick. In the last panel the boy has written a message beginning, "Resolved! That druggists are legalized robbers; they sell you soda and candy to make you ill, then they sell you medicine to make you worse." Outcault left for William Randolph Hearst's employ in 1906, and after a court battle, Outcault continued his strip, now nameless, in Hearst papers, while the Herald continued their own version of Buster Brown with other artists. The latter lasted until 1911 or so, and the former until at least 1921. Buster Brown's association with shoes when the Brown Shoe Co. purchased rights to the Buster Brown name, and the brand was introduced to the public at the 1904 St. Louis World's Fair. The logo is still used on Brown shoes today. Richard Felton Outcault was a gifted newspaper comic artist, painter, and sketcher, who combined his talents to pioneer the creation of the modern comic strip. He created the first recurring comic strip character in 1896, the "Yellow Kid" of Hogan's Alley. He also created Buster Brown in 1902. Although Outcault was not the first cartoonist to utilize dialog boxes or panel strips, he popular comic strips set the industry standard for "funny pages" in newspapers. Outcault's cartoon genius led to the birth and development of comic strips, which continue to influence modern culture. His pioneering work demonstrated that comic strips could increase newspaper revenues and also spawn sales of associated toys and paraphernalia. The success of the "Yellow Kid" led to lines of toys and products being developed. Buster Brown was also extremely popular and, after Outcault sold the license for Buster to the Buster Brown Shoes Company, "Mary Jane" shoes, based on the shoes Buster and his sister Mary Jane wore, became very popular and continue to be so to this day. All links retrieved March 6, 2015. History of "Richard Felton Outcault"
This page was last modified on 6 March 2015, at 17:44.